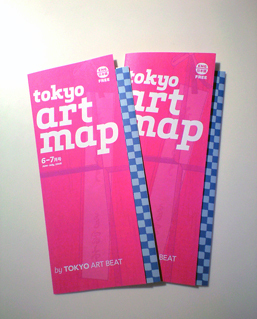 Tokyo Art Map – Neighborhood distribution campaign! Have you seen the 2nd issue of the Tokyo Art Map for June-July? Since early June, we’ve given away 80,000 of them at 200+ locations in Tokyo, up from 120 for the 1st issue. The latest issue of our Tokyo Art Map is here (download it here). It again features more than 50 art & design events in locations popular with the TAB users. We have added 2 areas: Harajuku and Yokohama. Even with all these maps, there are still plenty of untouched corners in the city, and with 20,000 more maps sitting in our closet. Come pick up some flyers, meet the TAB team, visit the new offices, and help spread the word about the broad range of cultural events happening in Tokyo. * Tokyo is a big city and we cannot cover it all on our own, but with your help our reach is boundless! * get 1 free entrance to a future TAB Talks or choose among other gifts (we also have Rough Guides to Tokyo to give away…). We have 2 sizes (both fit in a backpack). * 400 maps, in a pack of 23cm x 40cm x 10cm (~3 Kg) That’s 40 maps in 10 locations. * 200 maps, in a pack of 23cm x 20cm x 10cm (~1.5 Kg) That’s 40 maps in 5 locations. With your help, we can spread the word and support the creativity Tokyo’s famous for!